Very nice GroovyJ...very clean castings too. What odds Gelan will take one look at these and say..."I want a mould !" I can't say I blame him...they look lethal mate. Holy cow! What are you firing that in? Thats a flat nose pellet too isnt it? What if any ogive on it? Did you ream open the throat of your chamber to fit that in? Thats a flat nose pellet too isnt it? I spose it is ..
How does it shoot? Dont know just got it .. I can't wait to hear the shooting report on that one. What is the twist rate in your barrel and the length of the bullet? 14"twist should be ample for that HUGE pellet!!. Is that an aluminum mould? 14 should be perfect I'm hoping .. According to the Greenhill formula a 1-in-18" twist should be fast enough for velocities under 2000 ft/sec. 1-in-22" for velocities over 2000 ft/sec. 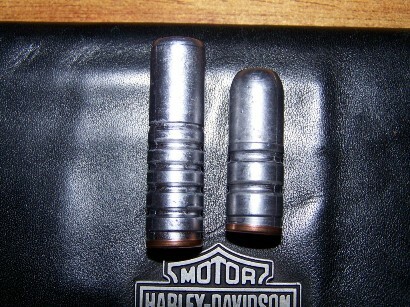 Another way to look at it is that a 1-in-14" twist should stabilize bullets up to 2.25" long. My .45-70 Marlins have a 1-in-20" but the Pedersoli "Remington" rolling block has a 1-in-18" twist... Hmmmm! I have the Greenhill chart too , and without looking 14 will stabilize 864 grains in .457 bore , I believe .. My charts dont have one for velocity , only length and weight ..
Theres a formula which isnt to complicated to use if you dont have the chart ..
Maybe! But you should not stop dreaming just because! not great result but should be doable for close distances. That alone should stop me from trying something like groovies bullet.